The villa's proximity to Renaissance Florence, close enough to dip in and out of the city's wonderful thoroughfares and delicious cafés, its incredible shopping and dining and the rich array of art galleries and museums, combined with its spectacular views across perfect swathes of Chianti countryside makes it one of Tuscany's most desirably located larger properties. Amongst its most striking features are the many broad and beautifully arranged terraces that spill out of the reception rooms and bedrooms through elegant French doors and overlook the lovely gardens and lushly ordered vineyards. 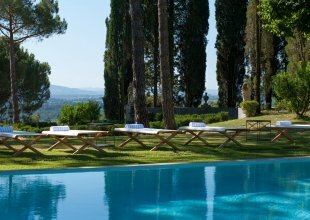 From these, there are views of Brunelleschi's famous Duomo across the trees in the distance, reminding you that although you are surrounded by countryside, Florence is within tantalising touching distance. Villa Machiavelli's restoration has ensured that this wonderful 15th century, historic home, once belonging to the Machiavelli and Mazzei families, has been brought sumptuously into modernity, ready to face the next century with many of its fabulous frescoes re-discovered under layers of paint and plaster. Of course many features have been modernised and the property re-furnished, but such was the quality of some of the property's original features that these have endured to the present day. Think bathrooms of rare marble, perfectly cut and joined, from quarries now no longer mined, stone and parquet flooring, antiques and many superb pieces of artwork. The superbly renovated interiors, sometimes quite bold in design, include a formal dining room, two lovely reception rooms, entrance hallway with 16th century frescoes, a family kitchen, four fireplaces and a laundry room. On the lower ground floor through large oak doors is a wonderfully atmospheric and intriguing wine cellar with an area that is set up for intimate dining, with kitchen alongside. In another area on this floor is a superb spa and gym facility with a private indoor pool and state of the art steam room and sauna. The individually decorated bedrooms are set over the ground and first floors, air conditioned and lead onto terraces with the most spectacular views over Chianti. Each has both a separate living room offering plenty of space and a dining area. Bathrooms are invariably fitted out in the most amazing configurations of marble - some of it extremely prized and rare and there are plasma TVs and WiFi broadband throughout. The villa's fascinating history reaches back to the 14th Century, when the property was built by the Machiavelli family and reputedly designed by Michelangelo himself. The original plans for improving the property are housed at the Uffizi Gallery in Florence. The plans include a a new wing and grander palace, designed by Giorgio Vasari il Giovane. To mark the occasion of the marriage between Machiavelli and Strozzi families, the two family's coats of arms were inscribed on the keystone of the central arch of the loggia on the main façade as well as the fireplace located on the ground floor of the villa. Niccolo Machiavelli is said to have written his famous work "The Prince" at his studio in Albergaccio, which was connected to main villa via an internal corridor. Later owner of the property Filipo Mazzei, an Italian physician and libertarian, was a close friend of US president Thomas Jefferson. The prices given are based on exclusive occupancy of all 10 bedrooms in the villa. N.B. The villa can be hired out for a minimum of 2 night stays during low and mid season and for a minimum of 3 nights during high season. Please enquire for a quote for your desired duration.